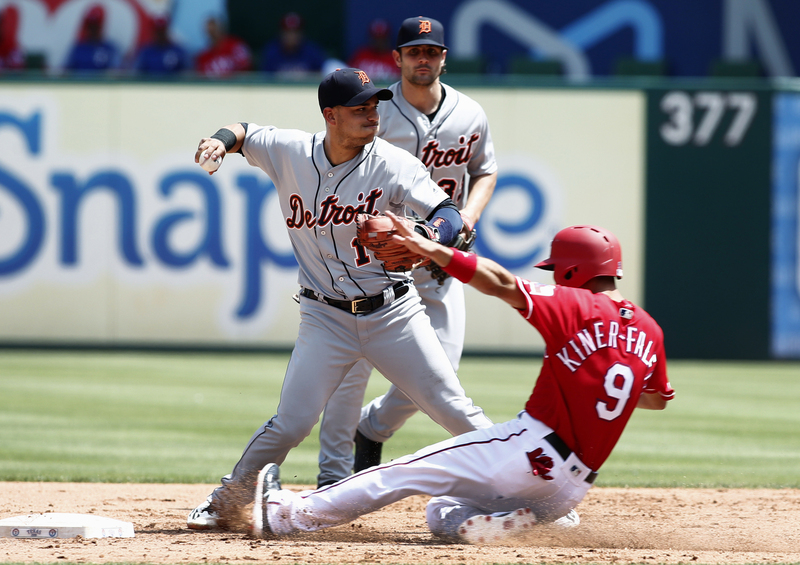 ARLINGTON, Texas (AP) — Nomar Mazara led off the 10th inning with his second homer of the game, giving the Texas Rangers a 5-4 victory over Detroit on Wednesday and their first winning home series this season. Mazara pulled a 1-0 pitch into the right field seats off Warwick Saupold (1-1), the sixth Tigers pitcher. It was his first career game-ending homer. Mazara has 10 home runs this season, seven in May. His drive estimated at 447 feet in the seventh inning had tied the game at 4. Rangers closer Keone Kela (3-2) struck out three in two innings, allowing only Niko Goodrum’s leadoff double in the 10th. The Rangers took two of three, but are still 7-16 overall at home. They had lost their first six home series, their most ever to start a season. Adrian Beltre, in his second game off the disabled list, had an RBI single and a sacrifice fly for Texas. He has 3,079 career hits and his 1,654 RBIs broke a tie with Tony Perez for 22nd on the all-time list. Pete Kozma homered in his first big league at-bat this season while Mikie Mahtook had a triple and a sacrifice fly in his return to the majors for the Tigers. Kozma homered in the third, then reached on an error in the fifth before coming home on Mahtook’s fly that tied the game against Bartolo Colon. The Tigers took a 4-3 lead went ahead in the sixth when Goodrum had a leadoff double against reliever Jesse Chavez and scored on James McCann’s single. Colon threw 98 pitches in five innings, leaving in a tie game after allowing three runs (two earned) with four strikeouts and a walk. The right-hander only two weeks shy of his 45th birthday, stayed at 241 career wins, two shy of Hall of Famer Juan Marichal for the most by a pitcher born in the Dominican Republic. Rangers CF Delino DeShields drew a career-high four walks, all leading off innings. He scored twice, but in the seventh was thrown out at third trying to advance two bases on Isiah Kiner-Falefa’s sacrifice bunt. It was the most walks in a nine-inning game by a Rangers player since Milton Bradley Jr. had four at Oakland on July 25, 2008. Tigers: OF Leonys Martin had been dealing with soreness behind his left knee for a couple of weeks before an MRI revealed a hamstring strain. … First base coach Ramon Santiago was hit in the upper body by McCann’s foul liner in the second inning. Santiago was OK.
Rangers: C Robinson Chirinos was scratched from the lineup because of left wrist soreness. He has been dealing with the issue for about three weeks. With an off day Thursday after he didn’t play Tuesday, Chirinos is getting a three-day break. Tigers: After playing 14 road games in 17 days since their last off day, the Tigers get a break Thursday before opening a six-game homestand. They play Seattle on Friday night. Rangers: A day off Thursday before opening a 10-game road trip. The Rangers are in Houston on Friday night.